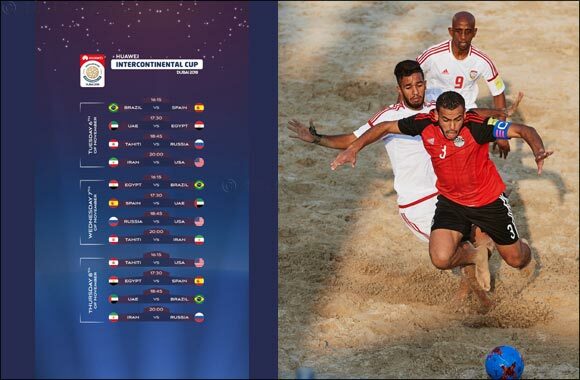 Dubai, UAE, October 21, 2018: Hosts UAE will take on familiar rivals Egypt in their opening match of the eighth Huawei Beach Soccer Intercontinental cup, taking the pitch at Kite Beach after the battle between three-time winners Brazil and debutant Spain on Tuesday, November 6. Drawn in the same group as reigning world champions Brazil, UAE will be looking to make it past the group stages for the first time since 2013, when they finished third for the second consecutive time following a thrilling 8-7 win over Switzerland. The Whites have not had much joy since, winning only one of their 12 matches in the following four years. So a strong start against Egypt, who are making their fourth consecutive appearance at the tournament, will be crucial to UAE’s hopes. The Emiratis have met Egypt twice in the Beach Soccer Intercontinental Cup – in 2017 and 2015 - and have lost both matches. The UAE will then take on Spain on the second day of the tournament before closing their group engagements against two-time defending champions Brazil, who have won the tournament in 2014 (def. Russia 3-2), 2016 (def. Iran 6-2) and 2017 (def. Portugal 2-0). In Group B, Russia, who are level with Brazil on three Intercontinental Cup titles, will take on 2017 World Cup runners-up Tahiti in their opening match on November 6, while 2013 champions Iran will square-off against United States on the opening night. Russia, the only side to compete in every single edition of the Intercontinental Cup along with their UAE hosts, will then meet USA on day two before taking on Iran on Thursday night, in what should be the most anticipated clash of the preliminary stages if the past between these two teams is any indication. This year, a state-of-the art stadium on Dubai’s Kite Beach will host the Beach Soccer Intercontinental Cup, which is one of the most anticipated and prestigious beach soccer competitions in the world, one that features the globe’s best teams in the beautiful and unique city of Dubai. The tournament, which will see Huawei as the presenting partner for a second consecutive year, will take place between November 6 and 10. The official draw for the tournament was held at the Dubai Sports Council headquarters on October 10 and the pots sent defending champions Brazil, Egypt, Spain and hosts UAE into Group A, whereas Russia, Iran, 2015 and 2017 FIFA Beach Soccer World Cup runner-ups Tahiti and USA were drawn in Group B.